"I will tell you what lies in your future..."
Nobody except Rikk himself knows anything about his past. 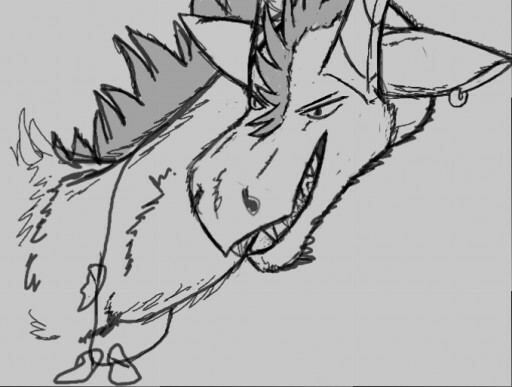 He simply wandered into the forest one day and found himself surrounded by a tribe of fellow drakes. They called themselves the Skull Tribe, and were known for their habit of roaming the deep forests and for their obscure religious beliefs. Rikk introduced himself as a wandering fortuneteller with no home, and the chieftain, Seth, invited him to join the tribe. 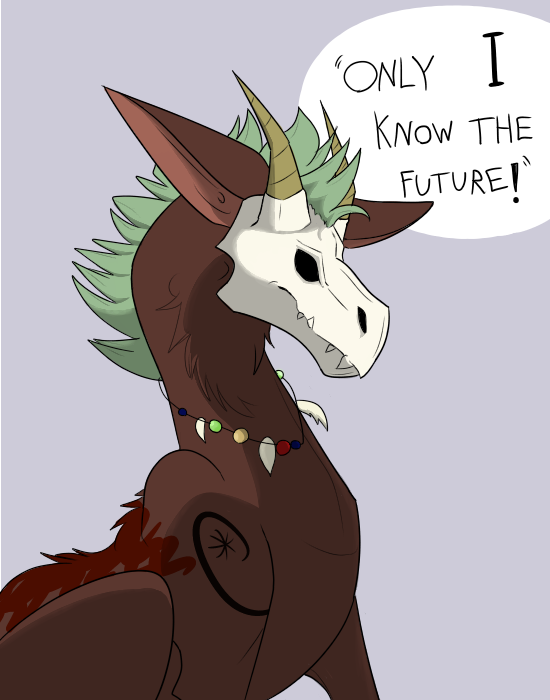 Though most see him as a creepy but otherwise harmless shaman, Seth knows better. Seth knows that what Rikk really wants is to gain control of his people, one manipulative whisper at a time... and he doesn't trust Rikk one bit. For most part, Rikk upholds the appearance of a stereotypical, mysterious fortuneteller. He is skilled at capturing the attention of others, and enjoys occasionally causing fear with his predictions. He has become slightly arrogant over the years due to the respect he gets from his fellow tribesmen, who believe he is the only one capable of communicating with spirits. But underneath his false persona, he is a greedy and careless individual with highly questionable ambitions. He is fully aware of the power he holds over the tribe and wants to someday gain complete control over them, leading him to view Seth, the chieftain, as a rival of sorts. The few people who don't respect him are usually mistrustful of him, and for good reason. Rikk is not interested in many things and becomes impatient when forced into a discussion about something he considers meaningless. The few subjects that do hold his interest, he cares about fiercely. Despite not having any of the magical powers he is credited for, he still believes in the existence of ghosts, spirits, and several of his tribe's gods, although he points out that he can't prove the existence of any of these things, and likely only believes in them to a certain extent. He is also curious about 'real' fortunetelling, though scoffs at anyone who claims they have such an ability. 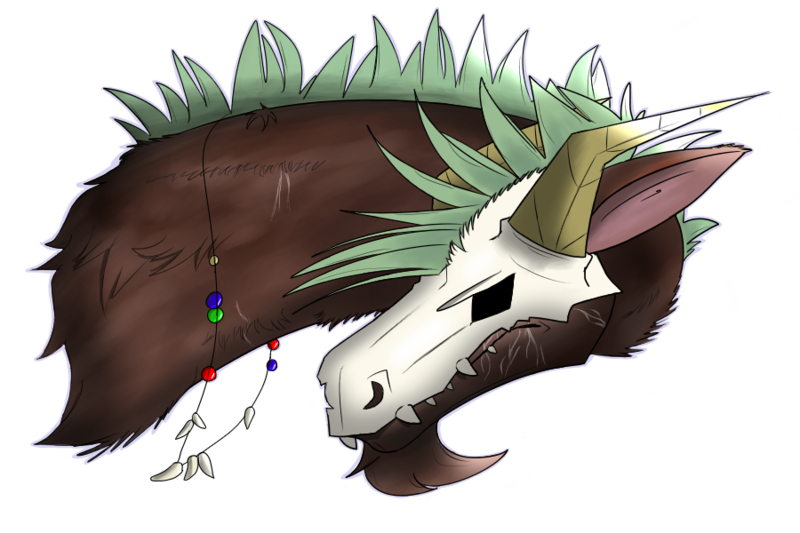 Rikk possesses a very dark sense of humour, openly joking about death, and has a slight fascination with bones, skulls, and other remnants of long-dead animals. He also loves money and treasure, hence why some of his accessories are inlaid with precious gemstones, and why he enjoys scamming others. 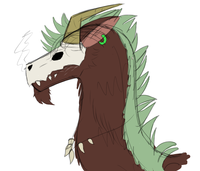 Rikk is a small drake with reddish-brown fur, a bristly green mane, and black/dark red markings that resemble tribal tattoos or war paint (though they're natural). 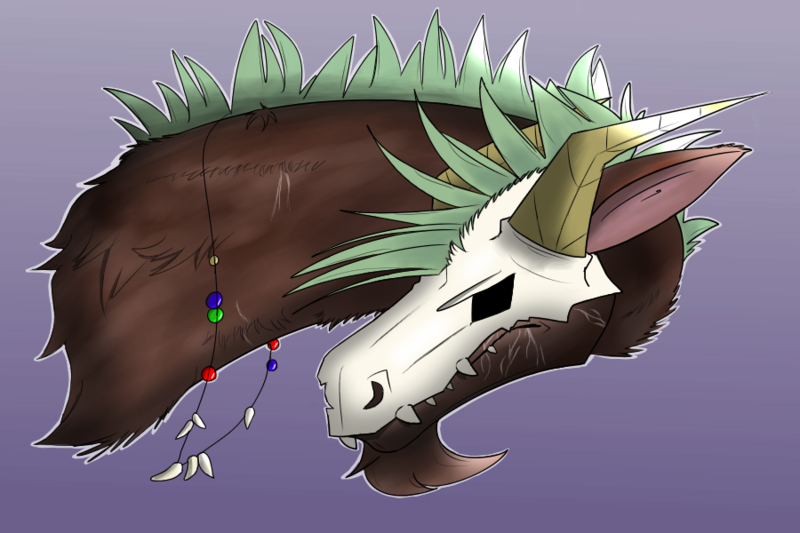 He wears a drake skull over the upper half of his head*, hiding his expression. However, he has long and very expressive ears which respond like a dog or cat's ears, often giving away what he's feeling. He has several red feathers growing from his tail. Underneath his mask, his eyes are pink. * If you look through his gallery you'll see that older art shows him with a helmet-like mask, while newer art shows the mask only covering his upper head. The newer version is the canonical one, but I don't mind people drawing him with the old mask design. - Hates anything to do with crowds and noise. 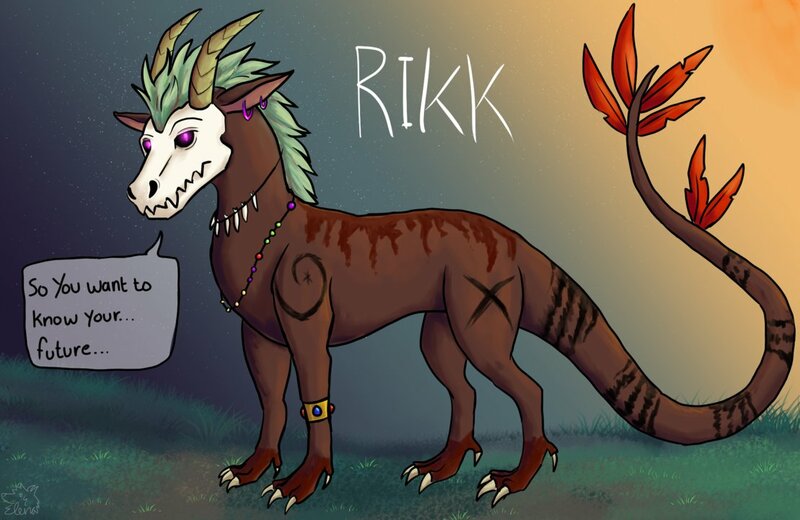 If his tribe are having a party, you can be sure Rikk won't be seen anywhere near them. - Has incredibly good hearing, though this does make him sensitive to loud noises (hence the above fact). His sense of smell is worse than a human's. - Is very good at imitating other peoples' voices or just putting on creepy voices for effect. 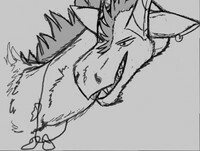 - Likes collecting bones and feathers. - Refuses to eat anything except nuts, berries and mushrooms, even if he's starving.